If you are looking for Acu-Rite DRO 203 digital readouts (one, two or three axes) for sale or replacement parts then you are welcome to contact us at (972) 822-0478 or contact us with your questions. The ACU-RITE DRO 203 digital readouts are versatile digital readouts for up to three axes. The ACU-RITE DRO 203 digital readout is especially well-suited for use on milling,drilling, boring, and lathes machines with up to three axes. The DRO 203 digital readout is designed as a sturdy upright unit with splash-proof full-travel keypad for use in a workshop. 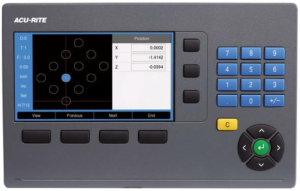 It is equipped with a 7” TFT color screen for position values, dialog, input displays, graphic functions, and for a graphic positioning aid. positioning tasks. You approach the next position quickly and reliably by simply traversing until the display reads zero. The functions for the respective application are easy to activate via parameter input. Special functions are available for producing hole patterns (linear patterns and circular patterns). You can easily switch between radius and diameter display when the position display is configured for turning. The digital readout also offers support for lathes with a separate top slide: the sum display feature allows you to display the saddle and top slides either together or separately. To set presets, simply touch the workpiece and freeze the tool position. Then retract and measure the workpiece with the tool out of the way. When you switch on the digital readout for the first time, the DRO203 supports you with an installation guide. You are led step by step through the most important settings until the device is ready for operation. Depending on the ambient-light conditions at the machine, you can switch the screen of the DRO203 to a light or dark background.